In November with the Soviet Red Army approaching through Poland, Himmler ordered gassing operations to cease across the Reich. Crematoria II, III, and IV were dismantled, while Crematorium I was transformed into an air raid shelter. The Sonderkommando were ordered to remove other evidence of the killings, including the mass graves. The SS destroyed written records, and in the final week before the camp's liberation, burned or demolished many of its buildings. Himmler ordered the evacuation of all camps in January 1945, charging camp commanders with "making sure that not a single prisoner from the concentration camps falls alive into the hands of the enemy." 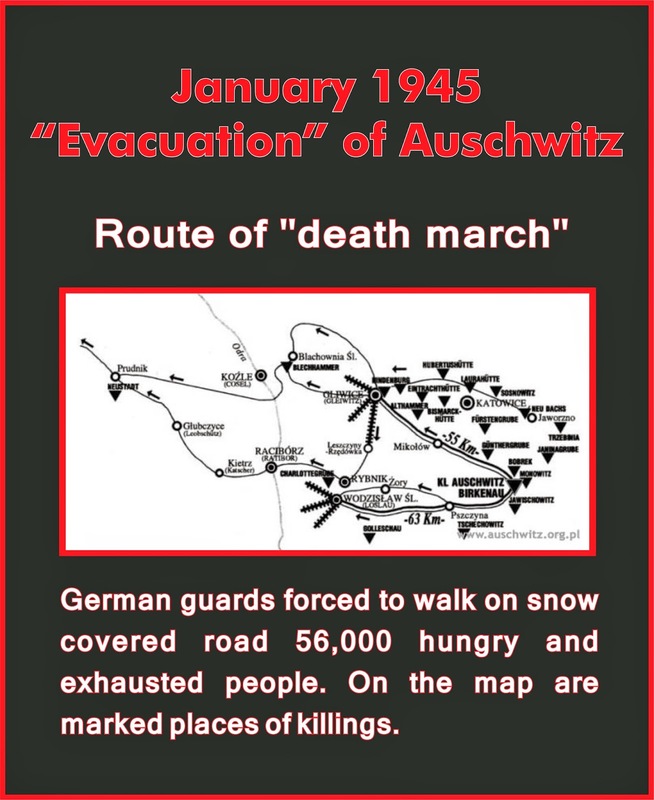 On January 17, 58,000 Auschwitz detainees were evacuated under guard, largely on foot; thousands of them died in the subsequent death march west towards Wodzisław Śląski. Approximately 20,000 Auschwitz prisoners made it toBergen-Belsen concentration camp in Germany, where they were liberated by the British in April 1945. Those too weak or sick to walk were left behind. When the 322nd Rifle Division of the Red Army arrived at the camp on January 27 they found around 7,500 prisoners and about 600 corpses had been left behind. Among the items found by the Soviet soldiers were 370,000 men's suits, 837,000 women's garments, and 7.7 tonnes (8.5 short tons) of human hair.